A special middle grade debut of magic and courage in a world of witches, written with the charm and enchantment of Circus Mirandus and The Apothecary. Arianwyn has flunked her witch's assessment: She's doomed. Declared an apprentice and sent to the town of Lull in disgrace, she may never become a real witch-- much to the glee of her arch-rival, Gimma. With every spirit banished, creature helped, and spell cast, Arianwyn starts to get the hang of being a witch--even if she's only an apprentice. But the worst still lies ahead. For a sinister darkness has begun to haunt her spells, and there may be much more at stake than just her pride . . . for Arianwyn and the entire land. James Nicol has loved books and stories his whole life. As a child he spent hours absorbed in novels, watching epic 1980s cartoons or adventuring in the wood at the bottom of the garden. He lives on the edge of the Cambridgeshire Fens with his partner and a black and white cockapoo called Bonnie. 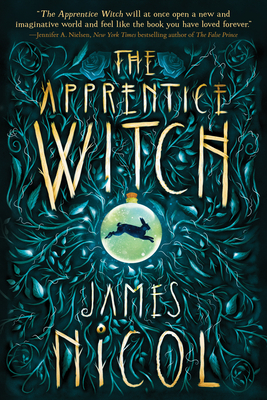 The Apprentice Witch is his children’s debut. You can visit him at @jamesenicol.